Oh... uh... you remembered that did you? Of course I did... and yes I will watch whatever is sent to me. But it just might take a while. Now, Pete... when someone sends you a kind gift, you should make the effort to tell them as soon as possible how much you really enjoyed it. I just had a terrible thought. What if (She hasn't told me what yet) the music one is Rocky Horror Picture Show? LOL... I bet you do. And no it is not Rocky Horror Picture Show. She sent me a list of what she is sending me. 25 movies! And the music one is... Ray. What a relief. At least this one is also a biography or sorts as well... I think I could actually get into the storyline of this one... and be able to (for the most part) ignore the music. Pete, when did you first come to the realisation that you dislike music so much? Pete, did you ever liek music to any extent? I mean, when I asked people in the past, some would answer "radio", meaning that they'll just listen to whatever is there. Noone ever said they hate music. I don't remember ever liking it. It really isn't something I can explain. It is just something that is I guess. On a family vacation to Hawaii, Ray rekindles an old romance with Tito's cousin, Noelani. Reggie and Otto feel dissed since Ray keeps canceling their extreme sports plans because Noelani says they're too dangerous. As the final straw, Reggie and Otto defy Ray to take off to surf the perilous Banzai Pipeline. But it's too late when they realize Noelani was right about this one! Oh yeah, I remember this from when Hey Arnold! and CatDog were still on the air. (Or somehwere around there.) Reggie, Otto, Twister, Squid. The cartoons didn't make more extreme kids!! Although I always liked the show, the movie I didn't care for too much. Don't get me wrong the "Evil little men" Menehune thing was funny! But the thing about Ray finding a girl and the kids getting jealous, idk, just don't care for it. Everyone loves Scooby doo, and this is one of my favorites! Alot like the TV show with a Spanish accent!! There are a lot of good laughs in the movie, like Shaggy closing the door on Fred thinking he's el Chupacabra. 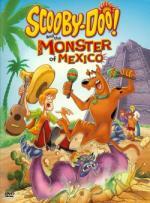 The movie also fits in a fair amount of Mexican culture, which I must say is pretty impressive for a cartoon. I actually saw bits and pieces of this at my grandmother's house, so I was curious. It was a lot different than the William Castle "13 Ghosts"!! Very nicely made, may I say. The stories all tie in with each other. Pretty scary, got the chills a few times. Definitely something worth seeing! This not fair... Britt can watch my horror movies... but I can't! I hope you can't hear them from where you are. That would be like passive smoking. Nope... can't hear a thing... Darn it!